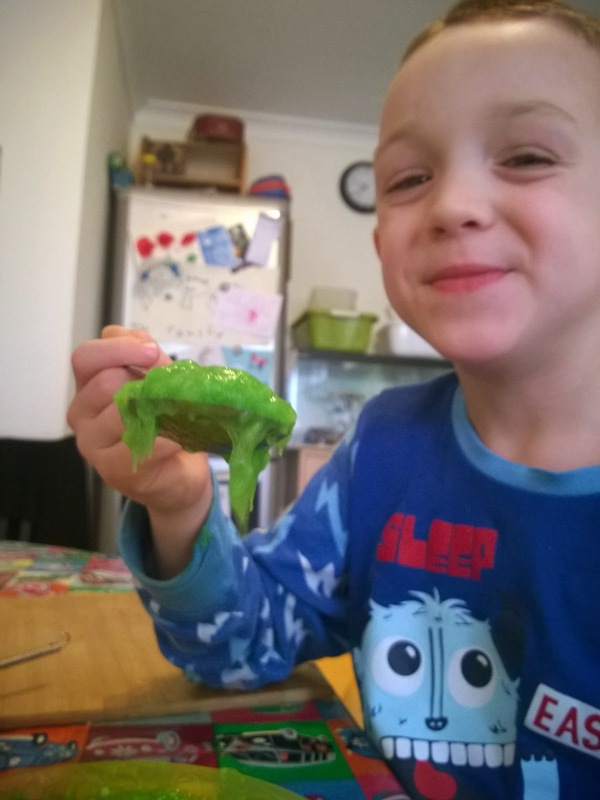 I discovered a new idea for making slime a couple of weeks ago. I got a book by ethnobotanist James Wong for my birthday, and in it there was a recipe for making a hair mask using xanthan gum as a thickener. This stuff was seriously slippery and gloopy and seeded the idea that it would make a brilliant home made ectoplasm/mucus type slime. You may not have come across xanthan gum before unless you do a lot of wheat free baking, but it crops up in lots of foods and cosmetics as a thickener or stabiliser (E415 on food labels). It's made by fermenting sugar such as glucose is a polysaccharide (a long chain of sugar molecules) considered safe for consumption by most sources, so is an ideal ingredient for home science - it won't matter if the kids eat a little and I found it didn't irritate our skin the way PVA and borax slime does. 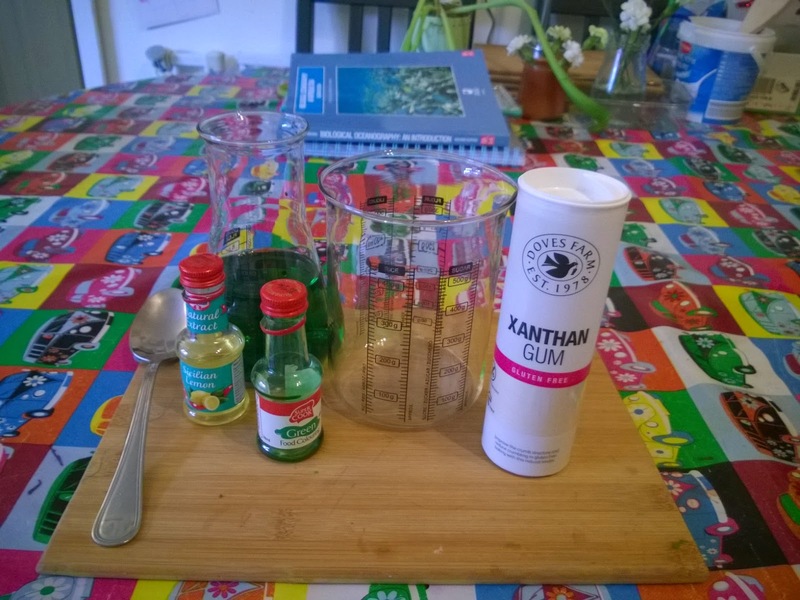 Xanthan gum has a brilliant ability to increase the viscosity of liquids, with a little going a long way. 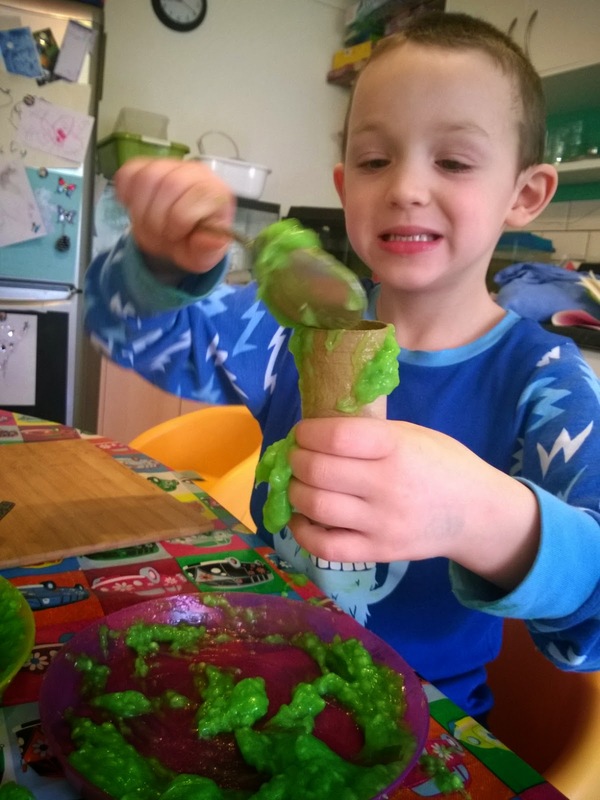 It also makes a good slime to use alongside cornflour slime to demonstrate the difference between shear thickening and shear thinning liquids. Xanthan gum slime physically acts in the opposite way to corn starch slime, demonstrating shear thinning compared with corn starch slime's shear thickening. In other words, stir xanthan gum slime and it gets runnier, thickening when you quit stirring it, whereas cornstarch slime is a non-Newtonian liquid, thickening as you stir it and going runny again when you stop. We used about 2 level dessert spoons of xanthan gum (bought from the gluten free section of our local supermarket) mixed with about 400ml water, plus green food colouring and lemon essence. I'm not completely sure about proportions because part of the fun was letting the kids add a little bit of this and a little bit of that to see what happened, but it's easy to add a little more water or powder to get the consistency you want. We got a lumpy wallpaper paste consistency from what the boys produced (note don't ever use actual wallpaper paste for kids play as it's full of antifungal chemicals and other nasties). When the kids were happy with the consistency we played with it in a variety of ways, spooning it, pouring it and squishing it. We even tested it as a glue by smearing a little on paper and sticking it to an old envelope (it works really well, pending longevity test). 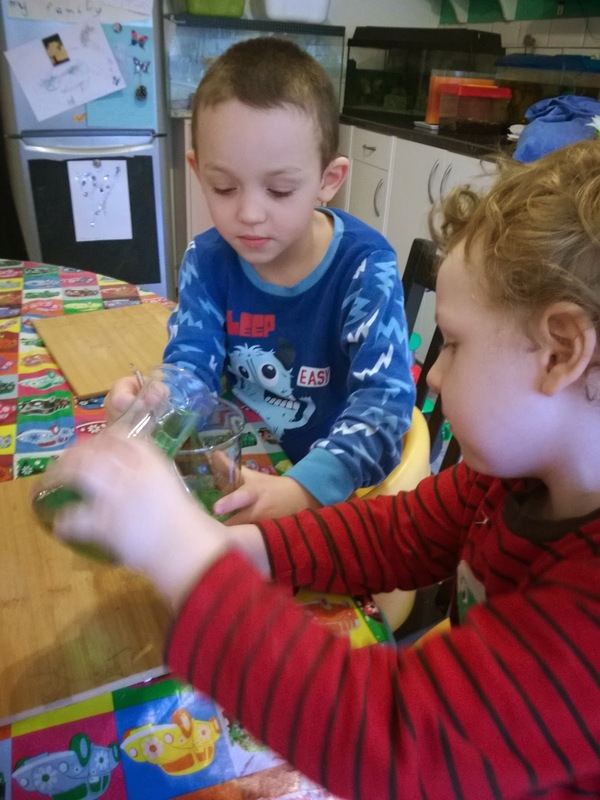 I encouraged the boys to make predictions about how viscous the slime was and whether adding more water would make it runnier or thicker and make the slime pour down a tube faster or slower. I asked them to think about how we could experiment with the slime. 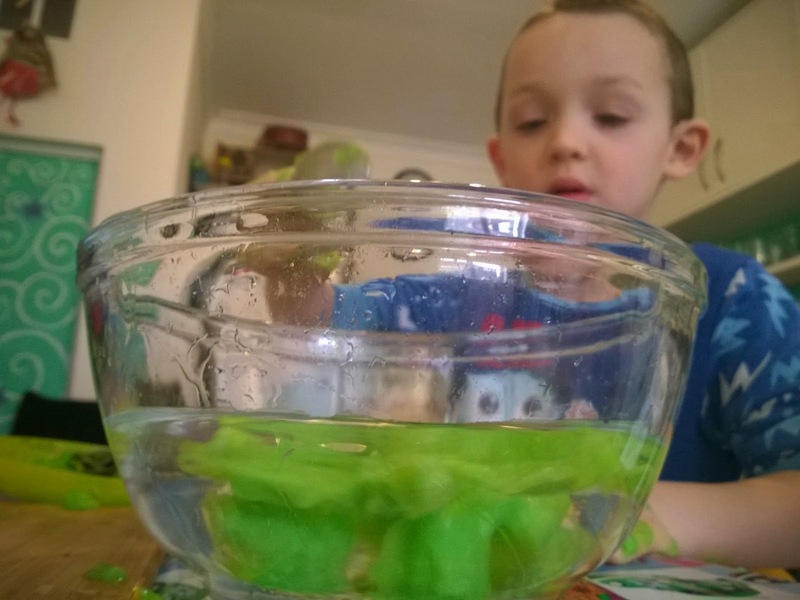 Ollie wanted to know if the slime would sink or float, and if it would dissolve if we put it in water. 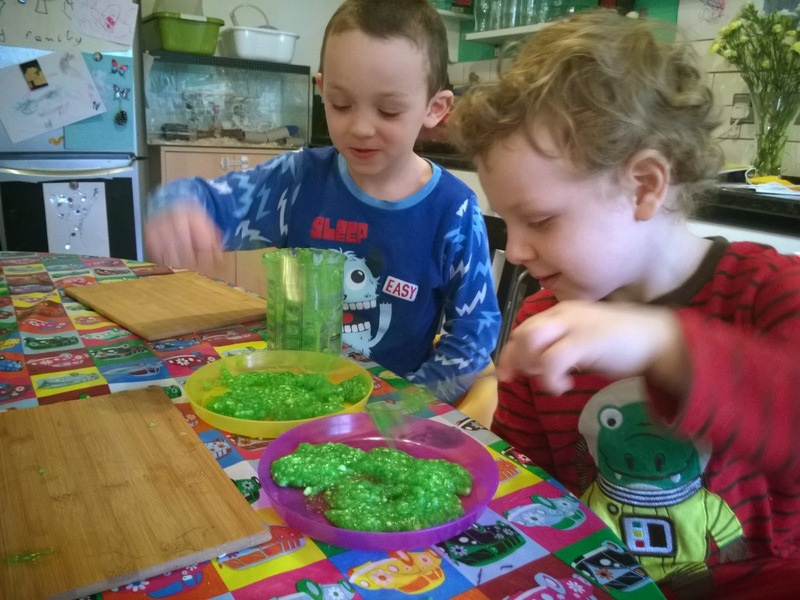 Toby was less keen on slimy hands than Ollie and was content poking it around with a spoon, while Ollie got up to his elbows in gunge. 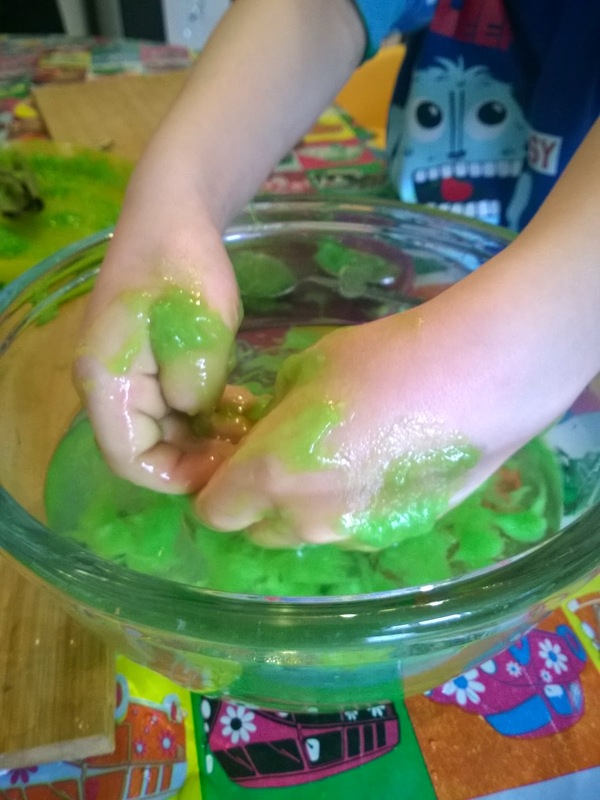 With colds season upon us, this slime makes a good model for explaining about mucus. Let it dry into a lump and that's a nice disgusting hard bogey, left wet sticky and slimey and it's the thick mucus from near the end of a cold or when you're a bit dehydrated, or add more water and you have a runny mucus like at the start of a cold. You could even make a clear runny mucus and then add more gum and particles of something to represent bacteria or pollen (I used spirulina powder previously) to make a thick germy mucus. Spirulina was also quite stinky so made a really unpleasant slime if you're really going for the gross factor. Notes: I expected this to be a messy activity requiring a change of clothes, hence why the boys are still in their pjs at 9 in the morning - easy enough to chuck slimy things into the washing machine. In the end though they stayed remarkable clean. The slime is very slimy so I wouldn't do this near carpets, but from hard surfaces it washes off with soap and water with no problem. This slime is made from food grade ingredients so it won't matter if a little is ingested, but I wouldn't recommend eating spoonfuls of the stuff either as it is an effective laxative.. Probably best to dispose of via compost heap or household waste bin, but if you do put it down the sink follow it with plenty of hot soapy water as it literally dries like glue, albeit a water soluble one.